Olga Neuwirth was born on 4th August 1968 in Graz, Austria. She is considered as one of the most interessting and avant-garde young composers in Europe. At the age of seven she already started trumpet lessons. She later studied composition in Vienna at the Vienna Academy of Music and Performing Arts and continued her studies at the Conservatory of Music in San Francisco with Elinor Armer. 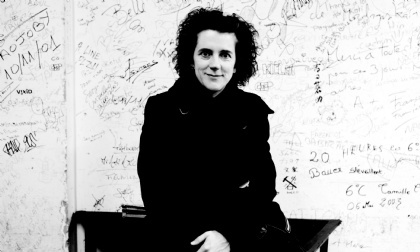 Olga Neuwirth was strongly influenced by Adriana Hölszky, Luigi Nono und Tristan Murail. In Paris she attended IRCAM’s Stage d’informatique musicale and lessons with Murail. She made her breakthrough in 1999 with Bählamms Fest (text: Leonora Carrington, libretto: Elfriede Jelinek). For this work she received the Ernst Krenek Prize. Her piece, Clinamen/Nodus, which was written for Pierre Boulez and the London Symphony Orchestra, could be heard on a worldwide tour. The Long Rain, a project in collaboration with the film maker Michael Kreihsl, was premiered at steirischer herbst in 2000. Ce qui arrive with Ensemble Modern, after texts by Paul Auster, was premiered in the same place in 2004 (European tour). 2006 saw premieres at the Wiener Festwochen (The Don Giovanni Complex) and at the Salzburger Festspielen, with a work for trumpet and orchestra written for the Vienna Philharmonic. The "haute école" of vocal singing also known as Neue Vocalsolisten Stuttgart.